After nine albums containing well articulated – if occasionally solipsistic - dispatches from the furthest and deepest depths of existential angst, forgiveness would be due to those rolling their eyeballs and expecting more of the same from Eels. Indeed, if any one artist stands as the poster boy for self-doubt, suffering and sadness then it's the band's driving force, Mark Everett aka E. Not that he's blinked when facing down issues of mortality, bereavement and cosmic isolation but E's near monopolising of despair would give even Morrissey pause for concern. Eels have been quiet since the trilogy of albums – that'll be Hombre Lobo, End Times and Tomorrow Morning - that were released in quick succession in 2010. Variously dealing with the search for emotional fulfilment, its subsequent loss and aftermath, Everett was left probably as drained as the listeners who had their feelings put through the wringer with a surfeit of information in such a short space. So if we take it as a given that E will be looking deep into himself to the point of self-hypnosis, the question of which E we'll be getting – Contemplative? Mourning? Heartbroken? – remains firmly in place. 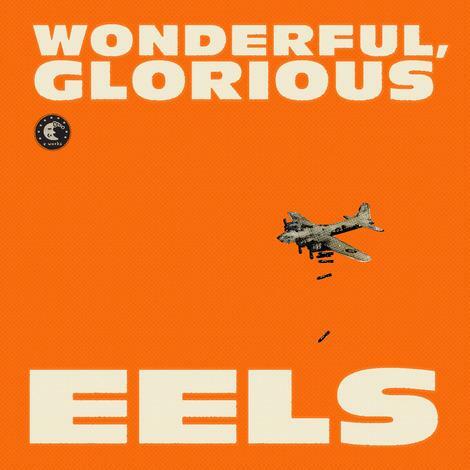 Wonderful, Glorious is a contrary bugger but one that nails its colours to the mast early on. This is E in combative mood, a fighter bouncing from one foot to another as his mouth shield is put into place while anxiously awaiting the ring of the bell. The one-two of opening tracks 'Bombs Away' and 'Kinda Fuzzy' see E moving into the centre of the ring in full-on attacking mode. "I'll no longer keep my mouth shut," he declares on the former before counter attacking with "Don't mess with me I'm up for the fight" on the latter. A fine statement of intent, the musical accompaniment – as evidenced later, too, on 'Peach Blossom' - suggests that Tom Waits may have been given a few spins at home. Alas, as early as 'Accident Prone', Eels slip into the default setting of self-pity that undoes much of the good work contained here. Compared to the two tracks that precede it, the song drops like a 747 hitting an air pocket while flying through El Nino. Similarly, 'New Alphabet''s ham-fisted coupling of "Yesterday… it was brutal with plenty of tissues/I guess you could say that I had issues" feels like little more than a dreadful self-parody or a serious lack of editorial brutality. Indeed, spread across 13 tracks – even more if you opt for the special edition – Wonderful, Glorious could do with some judicious pruning. Despite the album's excellent production – the sounds are beautifully captured and arranged – its middle section sags and drags its weight too much for any lasting effect to be made though the final title track does much to live up to its name. Intermittently enjoyable, Wonderful, Glorious is unmistakably the work of Eels but unlike previous and successful meditations, their tenth album frequently feels like well-honed schtick rather than a worthwhile insight.